Guest post by Miranda Wang and Ashrut Narula. GSA is currently accepting proposals from students and postdocs for the next round of Career Development Symposia. Gain leadership experience and serve the early career scientist community! 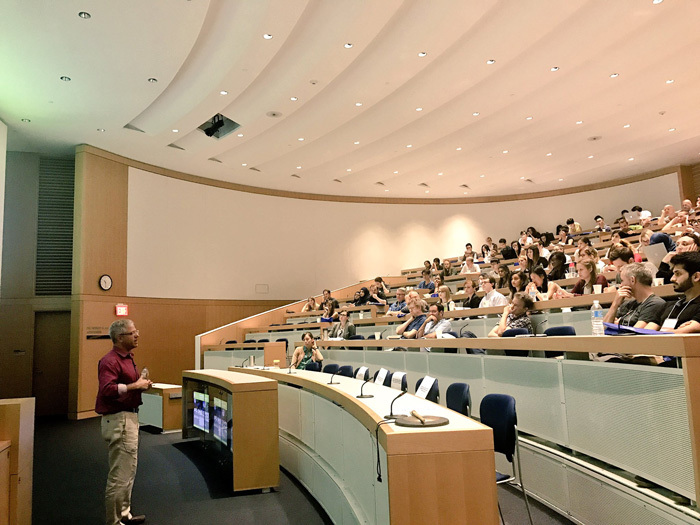 On August 2nd, 2017, the second annual Toronto RNA Enthusiasts’ Day (TREnD) was held at the Peter Gilgan Centre for Research and Learning at the Hospital for Sick Children in Toronto, Canada. The Symposium was a student-led and trainee-focused event spearheaded by graduate students at the University of Toronto. TREnD aimed to bring together the vibrant and diverse RNA biology community in the Greater Toronto Area to create a platform for researchers of every level. The conference was sponsored in part by the GSA through its Career Development Symposia program, which supports events that contribute to the career development of early career members. The event was very well received, with over 180 RNA enthusiasts in attendance from across Ontario, Quebec, New York state, and beyond. The day began with a keynote address by Phillip Zamore (University of Massachusetts Medical School) focusing on his recent work in the field of piRNAs. One of the main aims of TREnD is to provide an opportunity for trainees across all career stages to showcase their research, and the remainder of the day featured twelve oral presentations from graduate students and postdocs. Matthew Berg, a student from the Brandl lab at the University of Western Ontario, took home the trainee-voted prize for best talk of the day for his work on the evolution of mistranslating tRNAs. There was a lively poster session with over sixty poster presenters, with the best poster prize awarded to Andrea Brumwell (University of Guleph), and a special undergrad prize awarded to Jimmy Ly (University of Toronto). A host of private sponsor partners were present at the event and were well received by attendees. Thanks to the generous help and support of the Genetics Society of America, TREnD 2017 was able to create a platform for trainees to exchange ideas, establish collaborations, and obtain scientific feedback on their own projects. Plans are already underway for next year’s symposium, and if you can’t wait until next year, you can get your monthly dose of RNA biology at the Toronto RNA Club meetings (http://www.torontorna.com). All RNA enthusiasts are welcome!